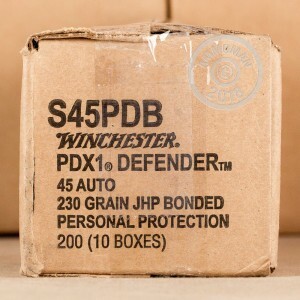 Winchester PDX1 Defender ammunition has earned the trust of many CCW holders as well as law enforcement agencies such as the FBI for self-defense purposes. 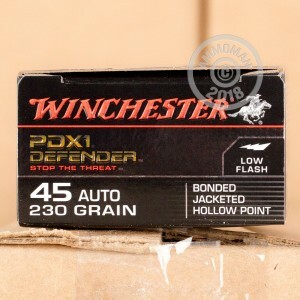 PDX1 cartridges feature a bonded-core bullet designed to expand into six petals with a diameter 1.5 times that of the projectile's original caliber. This particular .45 ACP load fires a heavy 230 grain hollow point bullet at 882 feet per second. As a powerful standard-pressure load, this ammo packs a wallop without going overboard in the recoil department. As a high-end defensive cartridge, this ammo features nickel-plated brass cases capable of withstanding long periods of carry. 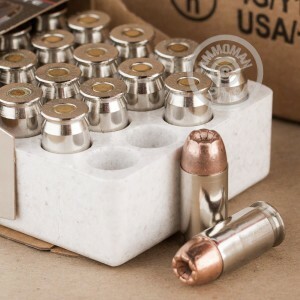 Grab this case of 200 to train and test more thoroughly before you carry this ammo--and enjoy free shipping from AmmoMan.com!